How good is your early modern paleography? One of the challenges and joys of the work we do in Footprints is the huge variety of handwritings that we find in the books we encounter. Owners of Jewish books spread from Afghanistan to Los Angeles, and beyond, and with owner inscriptions from the 15th to the 21st centuries, we have handwritings that run the gamut from clear and beautiful to downright messy. In some cases, it is not the handwriting that is a problem, but the script or language in which the words are written. A stamp in Polish, for instance, stumped a reader who was fluent in other languages. Sometimes only part of a phrase can be read, like this inscription, where the owner discusses the importance of signing his name in the book, but did not clearly write his own name. In all of these cases, the scholar entering the footprint added the words “Can you help?” to the Notes field of the footprint. If you search the words “Can you help” (without quotation marks), you’ll receive around fifty footprints in the results, all of which proved difficult to decipher for the scholars entering their data. So take a look! Whether your specialty is a 19th century Suriname, 17th century Europe, or loopy Roman characters, there are plenty of opportunities to assist. We are pleased to report on the progress of Footprints since our last update. The project has been growing steadily both in its technical and scholarly capabilities, and in its growing recognition in the world of Jewish studies and among practitioners of the Digital Humanities. We invite you to check out the recent developments in the site by visiting the following link: https://footprints.ccnmtl.columbia.edu/. The site has undergone a number of changes since its launch last year, thanks to our talented developers at the Center for Teaching and Learning. With our last update, we described the new capacity for batch upload, which allows us to enter hundreds of footprints with a single click. Access to these materials is now bi-directional: libraries and librarians can now export ranges of Footprints data to augment their own copy-specific catalogs with information reconstructed by scholars who have uploaded material to our site in the course of their individual research. The export function will also allow researchers to use Footprints to produce datasets relevant to their specific research questions for further analysis. Partnerships with libraries around the world have begun to yield results, and we look forward to adding data from many additional collections to the site. 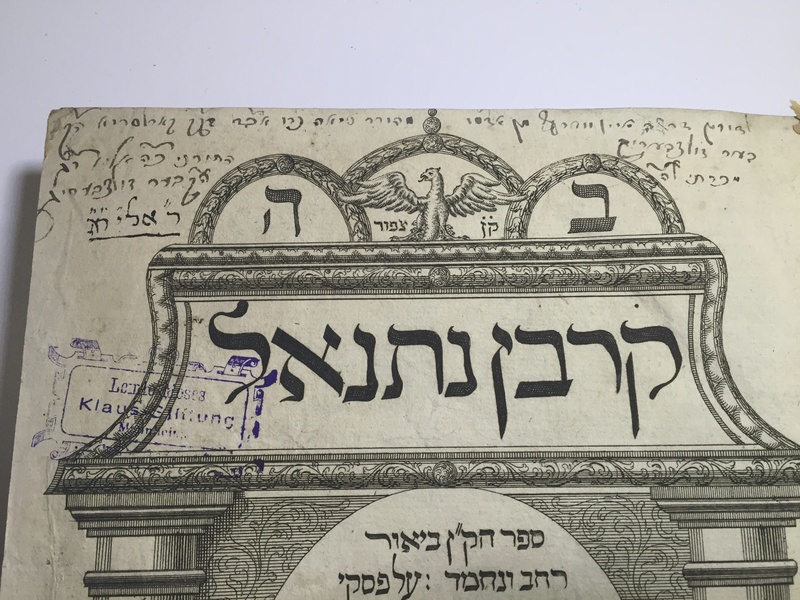 The Schneerson Collection at the State Library in Moscow is systematically adding provenance data from its collection, and a batch of data from Leo Baeck Institute in New York has been successfully uploaded. Within the next week, data from the provenance-rich Shimeon Brisman Collection, now at the University of Washington in St. Louis, Missouri, will be added to the site. Another batch collection, of data culled from Christie’s and Kestenbaum’s Judaica auction catalogs by an undergraduate researcher at the University of Pittsburgh, will follow the Brisman data. The site is now also increasingly easier to navigate. In an earlier stage, contributors to the site had to engage in a repetitive process of data entry; now the site migrates more data than before to populate shared fields with call numbers and permalinks to imprints and copies of books. Each new entry reduces the manual entry required of future contributors as the site stores and suggests titles, editions, and individuals involved in the historical transit of books. Footprints now also features enhanced visualization tools. Every individual footprint page is accompanied by notifications of “similar footprints,” inviting users to engage the web of people, places, and texts that the site brings together into a single field. We continue to hone the mapping functions, which will enable refined search parameters as site covers the map of Europe, the Americas, the Middle East, and beyond. We are very proud to partner with Marsh’s Library in Dublin and its Keeper, Jason McElligott, on a grant-funded project to catalog Marsh’s Judaica and enter their provenance into Footprints. The award will fund a three-month research fellowship for a librarian or scholar to produce a mutually beneficial work of copy-specific cataloging, which will be featured both in Marsh’s individual catalog and our own aggregated Footprints site. (Deadline to apply is March 1!) Marsh’s is an ideal partner in that its collection derives from the historical period covered by Footprints, and is sufficiently sized to produce a critical mass of results within a manageable body of data. Our project grows in response to productive conversation with colleagues in the fields of Jewish studies and the Digital Humanities. In February, co-director Joshua Teplitsky represented the Footprints project at an EAJS sponsored roundtable on the history of the Jewish book and digital humanities, hosted at the Universiteit van Amsterdam, coordinated by Andrea Schatz, Irene Zwiep, and Emile Schrijver. We have also been invited to demonstrate our project at Radboud University, Nijmegen for the workshop of the “Digitizing Enlightenment” Project. Footprints will also be featured at a Celebration of Teaching and Learning sponsored by CTL on March 6. As always, we welcome new collaborators, as well as feedback and questions. You can always reach us at footprints@columbia.edu. Many thanks to Eli Genauer for agreeing to write a blog post on one of his books represented in Footprints. The book discussed is a Bible – the last on the list of Bibles found in the database (click the + under the title of the book to see all Footprints for this and other books). Our book was published in 1797 in Amsterdam by the Proops family, which printed books from the late 17th century to the mid 19th century. This particular volume is Sefer Shemot of the Five Books of Moses. It features a beautiful woodcut of Moses receiving the Torah, along with Moses and Aaron, and a rendering of the Holy Temple. There are three owners’ marks in this book, described below. The first clearly identified owner was Simon Mutsemaker (Amsterdam, 1766-1827) who boldly signed his name on the book’s front flyleaf. We can assume he bought this volume as a part of a set of all five books of the Pentateuch, but only this one volume remains. 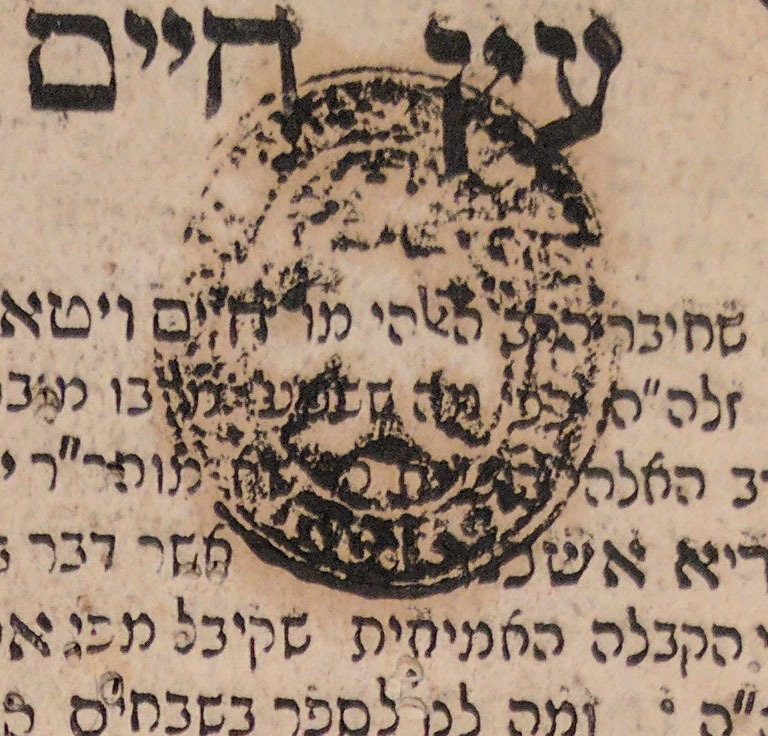 The next ownership stamp is not of an individual, but of an old age home in Amsterdam that housed a synagogue within it. Around the edges of the circle, the stamp reads “Ohel Yitschok *Of Catharina En Isaac Joseph Fedder Stichting* ” (Ohel Yitzchok of the Catharine and Isaac Joseph Fedder Foundation). 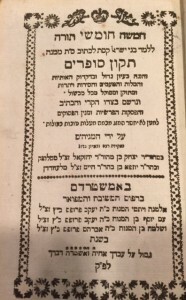 This indicates that the book belonged to the synagogue which was part of the old aged home established in the name of Catherine and Isaac Joseph Fedder. In the center of the stamp is the street on which the old age home was located, Weesperstraat, in Amsterdam (The Netherlands). On October 18, 1829 Isaac Joseph Vedder was born on Rapenburgerstraat. He married Catherine De Groot in 1855. In 1874 the couple moved to Weesperstraat 41. 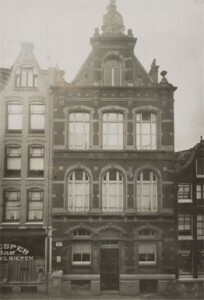 The property next to Weesperstraat 41 , number 43 , was purchased and the old men’s house was made from these two addresses. 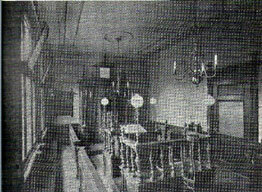 The synagogue was on the first floor, on the left side of the building. It was a small synagogue, only 7.50 x 4.20 meters, but an impressive beauty. On the east side was an Aron Ha-Kodesh – the holy ark. On the other three sides were the seats, at most 30. During World War II, all the residents in the home were killed by the Nazis. The building itself survived the early ravages of the war. However, in the winter of starvation (1944-45), precious wood was salvaged from the property to use for kindling. After the war the building had to be demolished. So what happened to this precious book? Aside from trying to physically destroy the Jewish people, the Nazis also systematically pillaged the treasures belonging to the Jewish community that bore witness to Jewish creativity and scholarship. Some of these treasures they planned to keep for themselves, but others were to be consigned to landfills or burned. After the war, there was a complex question of what to do with the surviving Jewish treasures, including many books, whose owner s were no longer alive. A tremendous effort was made to find appropriate homes for the multitude of now-ownerless books that had been confiscated. 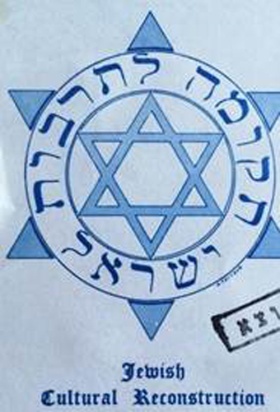 Much of that work was performed by the Jewish Cultural Reconstruction project. Among the many places these books were sent was the newly established State of Israel. Although none of the residents of this home for aged men survived the war, their book did, and is a testimony to the home’s existence. Somehow, possibly through more informal means, it found its way to Israel, to a place that may have seemed quite unfamiliar to those elderly Jews of Ashkenazic descent. There are, of course quite a few differences between Simon Mutsemaker, Catharina and Isaac Joseph Vetter, and the elderly Ashkenazic residents of the old age home on Weesperstraat 41 on the one hand, and those “young people” who prayed at the Yemenite synagogue in Rehovot on the other. They looked different, their Nusah of prayer was different and many of their Minhagim were different. But this book that united them was more important than all of that. It was a book of the Torah, the Sefer Shemot, which all these people believed to be the defining part of their religious heritage. We are pleased to announce many updates to Footprints website and to the project at large. The database has been growing in leaps and bounds (about 700 Footprints at last count), with promising directions for further expansion. Our talented developers at Columbia’s Center for Teaching and Learning have completed a function for “batch upload” of provenance data to the site–the large scale uploading of material based on extant library catalogs. We invite you check out the recent developments in the site by visiting the following link: https://footprints.ccnmtl.columbia.edu/. We have shared the first fruits of this endeavor at international scholarly conferences, where the project was well-received. We presented the project at last summer’s Association of Jewish Libraries meeting, the December meeting of the Association for Jewish Studies, and the January meeting of the American Historical Association, and we will be participating in this summer’s Sixteenth Century Studies Conference in Bruges. At these conferences, our work featured alongside other projects in the Digital Humanities, where we learned from their respective successes (and setbacks). Footprints has garnered interest in the scholarly community, and generated opportunities for institutional collaboration. We have recently uploaded records from Columbia University’s Rare Book and Manuscript Library, and are working with the librarians at other institutions to replicate this process. We are preparing hundreds more Footprints to add to the site for the batch upload, and we are constantly seeking more! We are cultivating connections with other librarians around the world who have provenance data in their catalog records, with an eye towards our goal of reaching the critical mass of 10,000 footprints by summer 2017. If you are interested in submitting your data as a batch, please contact us at footprints@columbia.edu for more information about batch specifications. Footprints will achieve its goal of advancing the state of the field in Jewish Book History when it impacts the nature of research. We are working on an event surrounding the 500th anniversary of first publication of Daniel Bomberg (Rabbinic Bible, 1517), to coincide with the World Congress of Jewish Studies in Jerusalem next summer. We look forward to sharing new developments with you as they continue to occur! As described in a previous post, we were very fortunate to have Tali Winkler, a Ph.D. candidate at the University of Chicago, work with the books in the library of Spertus Institute for Jewish Learning and Leadership, entering Footprints from its storied collection. Tali describes her experience further below (images courtesy Tali Winkler). In my earlier post, I described the excitement of learning about people, both known and unknown, from marginalia in the books. The second piece that stood out for me in my Footprints work was how we can learn about how books traveled from place to place. Sometimes it is even possible to identify multiple books belonging to the same collection, which had therefore been traveling together, perhaps for hundreds of years. About a month later, I encountered another book of responsa, Bet Yehudah, written by Judah ‘Ayash, a 17th century Algerian rabbi. The edition was also published in Livorno, in 1746. 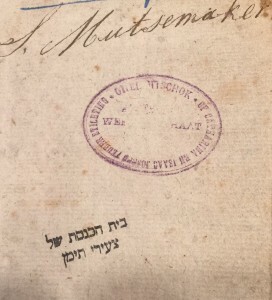 As I tried to decipher an inscription on the title page, I recognized the same “Binyamin” (see image below) from the responsa of the Radbaz, and excitedly realized that the title page also sported a stamp with the name of Rabbi Mendel Walman, albeit in blue ink. And finally, this book had also been acquired by Spertus before 1970. These two books, both books of responsa and both printed in Livorno, albeit about a century apart, had thus been traveling together since at least the 19th century, if not earlier, and had at least three owners in common! These small discoveries I made over the summer were really exciting for me at the time, but the broader implications of this method are perhaps even more exciting. Using owner inscriptions, scholars can potentially track the travels of individual books, reveal interactions between individuals in the context of the exchange of books, and even recreate the libraries of various individuals throughout time. Finally, one of the most fundamental elements of the Footprints project is its collaborative nature. 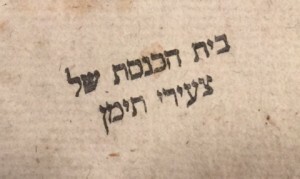 I could not read the rest of Binyamin’s inscription, for example, but hopefully someone else, looking at the picture uploaded to the footprint record, will be able to figure it out. So please, dear reader, give it a try and see if you can help! Footprints is open and ready for entries! This summer, we were very fortunate to have Tali Winkler, a Ph.D. candidate at the University of Chicago, work with the books in the library of Spertus Institute for Jewish Learning and Leadership, entering Footprints from its storied collection. Tali describes her experience below (images courtesy Tali Winkler). As a graduate student enthusiastically following the progress of Footprints since its inception, I was eager to participate in the process myself. 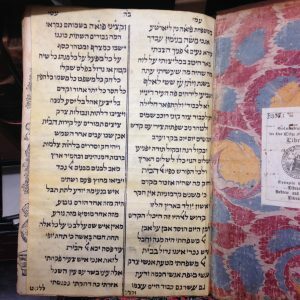 This summer, I had the opportunity to work with the rare book collection of the Spertus Institute for Jewish Learning and Leadership in Chicago, IL. 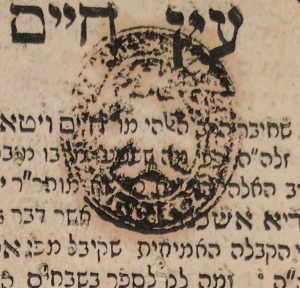 The library has an extensive collection of Hebrew printed books, many of which contain handwritten treasures on the margins of their pages. There are two aspects of this discovery process that I find most exciting, the first of which is described here. (The second will be described in a later post.) The marginalia in an individual book can teach us an immense amount about the book, its owner(s), and how the book itself was used. Often we can identify an owner from other historical records, in which case it adds a new dimension to what we already knew. On the other hand, often the owner is not otherwise known or identifiable; utilizing this type of primary source thus allows us to hear the voices of those individuals that may not otherwise have been preserved. A book titled Korban Netanel exemplifies this first exciting aspect of Footprints. 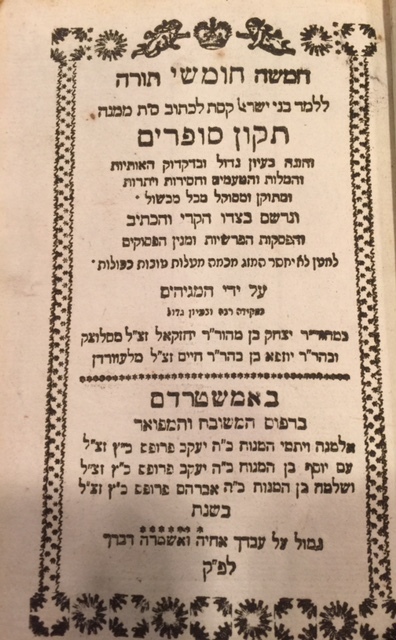 The work was written by Nathaniel Weil (1687-1769), a scholar who worked in Prague as the head of a yeshiva and was eventually appointed as the Chief Rabbi of the city of Karlsruhe, Germany in 1750. He remained in this position until his death in 1769. The work is a commentary on Asher ben Yechiel’s writings. 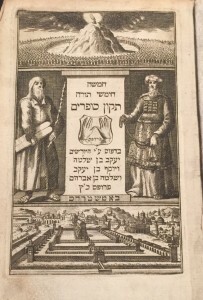 It was published for the first time in Karlsruhe in 1755; according to a note in the catalog record at Spertus, this was the first Hebrew book to be printed in the city of Karlsruhe. An inscription on the title page of the copy owned by Spertus provides a brief window into the “life” of that specific copy of the edition. The inscription was signed by two individuals: Tiah (Jedidiah) Weil (1721-1805) and a Rabbi Eli. Tiah Weil was the son of Nathaniel Weil; he succeeded his father as Chief Rabbi of Karlsruhe after his father’s death, and he too served in that position until his own death. I have not been able to identify Rabbi Eli. 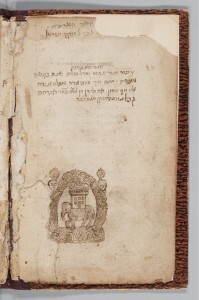 Tiah Weil wrote the majority of the inscription; in it, he explains that he was selling this copy to Rabbi Eli, rabbi of the city of Salzburg. He wrote the inscription while in Salzburg, and Rabbi Eli signed his own name beneath Tiah’s inscription. This short inscription captures a distinct historical moment of an interaction between two men, both leaders of Jewish communities in different cities. This moment encapsulates an exchange of scholarship, a physical object (i.e. the book), and presumably money or some other form of payment. It also reveals a great deal about the dissemination of books in this period; while conventional trade routes were presumably used as well, those involved in the printing of a work could take a more active personal role in the marketing of the book. 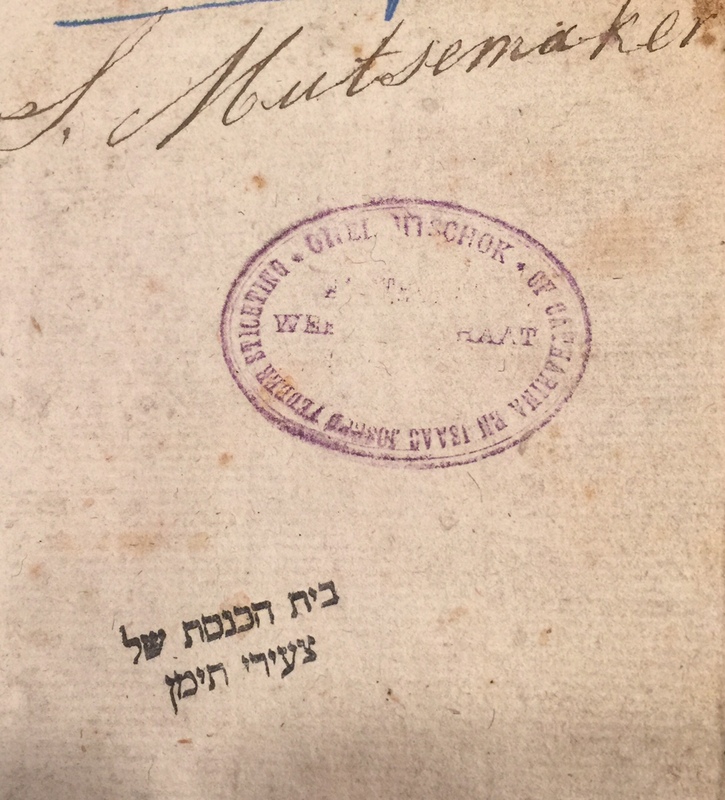 Conceivably Tiah Weil travelled with copies of his father’s book, with the intention of selling them to scholars he encountered during his travels. Perhaps there are even other extant copies of the Korban Netanel with inscriptions written by Tiah documenting sales to other scholars he encountered in his travels in Europe, waiting for the next Footprints contributor find them! Many of the owners’ marks traced in Footprints are of as-yet unknown people. I don’t know, for instance, who “Hayyim ben Tsevi Hirsch” is, nor “Yaakov Tsevi ben Dovid Yoel,” but there might be a scholar doing research on either individual on the other side of the country who can positively identify him, or perhaps an additional owner for books owned by him! This is exactly what happened with a book in the Columbia University Libraries. Columbia’s printed Judaica collection is composed of many different books, each with their own story to tell. Unfortunately, as of about year years ago, only about 1/3 of the printed Judaica were actually in the online catalog. 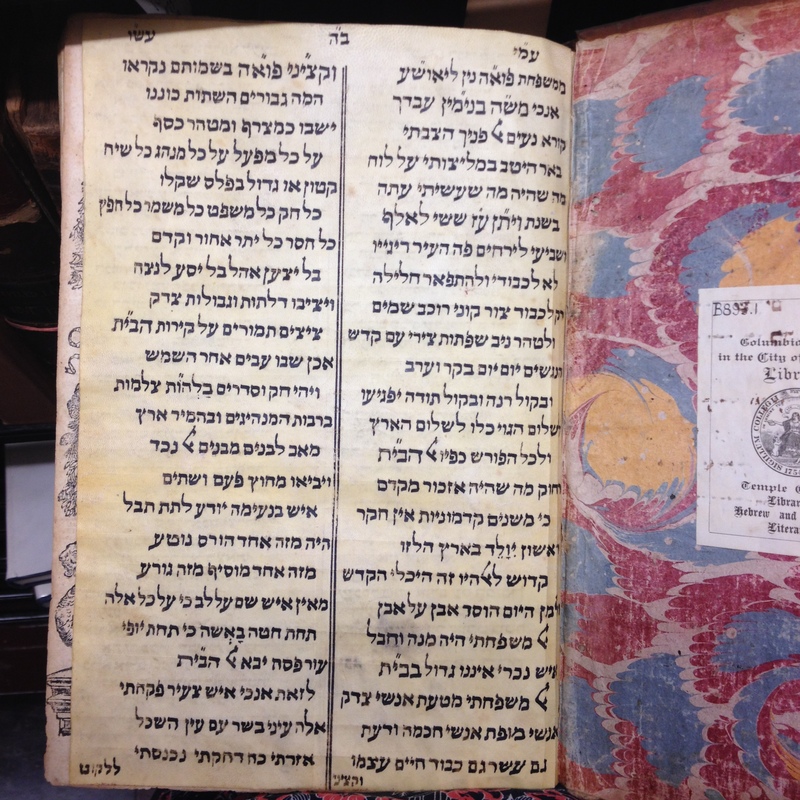 To rectify this, the Judaica librarian hired Hannah Vaitsblit, a Barnard student who has been carefully checking every Judaica book in the rare stacks to make sure that they are cataloged and thus accessible and known to any potential users. One of the things that Hannah excelled at was marking instances of provenance, that is, notes indicating ownership of the book throughout its existence. 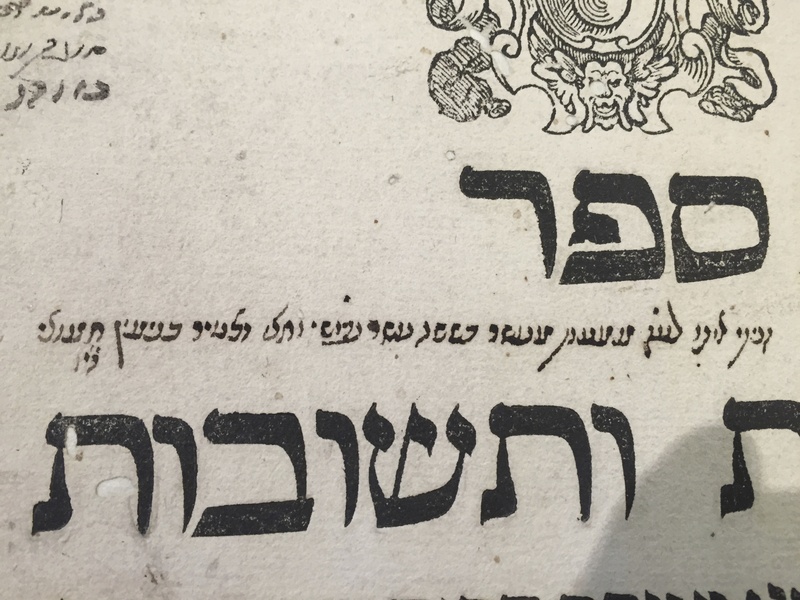 One of the books that Hannah found was a Latin copy of Josephus’s De Bello Judaica (Wars of the Jews), printed in Cologne in 1559. 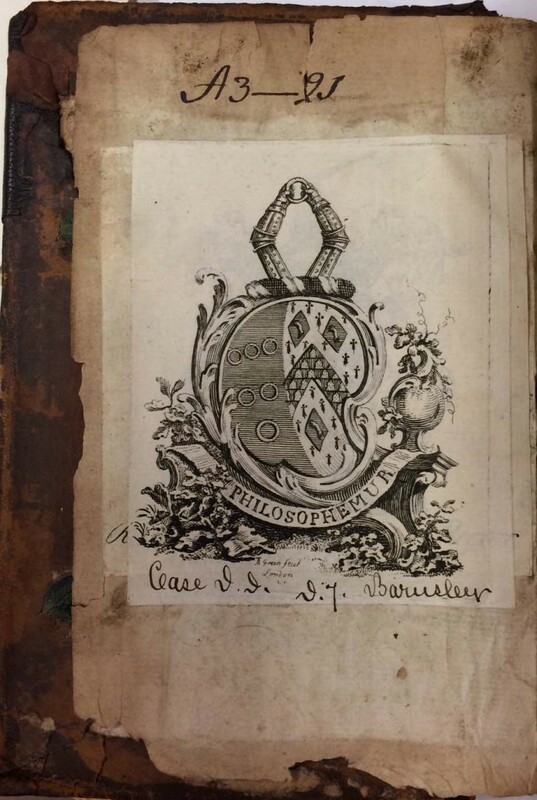 Hannah indicated the presence of the bookplate shown here, noting the “Philosophemur” shield as well as the Case information below it as she entered the record for the book into CLIO. The record was discovered by Newton scholar Professor Stephen Snobelen, who contacted Columbia asking for more information about the book. He asked us if there was an indicator of “A3-21,” which was the classmark for this book in the Musgrave library (one of the libraries that owned Newton’s books). A note on Professor Snobelen’s depth of research: Hannah had originally transcribed the last word in the text on the bottom of the plate as “Barusleer.” Since Prof. Snobelen is well versed in the travels of Newton’s library (described further below), he asked if it was possible that the text read “Barnsley.” A careful viewer can see that either reading is possible, but we know now that it was the latter. After Isaac Newton’s death, John Huggins, his neighbor, purchased the library for £300. (His bookplate can be seen peeking out underneath the “Philosophemur” plate.) The collection went from Huggins to his son Charles, and from Charles Huggins to James Musgrave, whose bookplate is seen above, with the family motto, “Philosophemur.” The library remained in the Musgrave family for generations, moving with them in 1778 to Barnsley Park, Gloucestershire, where the new classmarks were added in ink (on the bottom of the plate). The library was partially sold at auction in 1920, when it is likely that this book entered the market, ultimately ending up at Columbia in 1922. You can see all of the Footprints for the Josephus here. Other books from Newton’s library have been found at the Huntington Library (Mede’s Works), at the King’s College Library (interestingly, a Hebrew lexicon), at the University of Michigan‘s library, and at Cardiff University. When we first thought about the Footprints project, we had no idea of the complexities we would encounter. Neither, of course, did we know about how lucky we would be to have Columbia’s Center for New Media Teaching and Learning take on the entire technical burden of building the database so we would have the freedom to worry about the nitty gritty details. Like the word provenance, for instance. So the question before us was: according to the definition listed above, could we use “provenance” for the second kind of book? If provenance is used “as a guide to authenticity…” of a specific, known work of art or antique, this might cause a problem. After all, one of the records in the database is to a book which might have been owned at one time – it is documented by Yeshayahu Vinograd’s Thesaurus of the Hebrew Book (with a notation of “no known copy”), and not by the National Library of Israel’s Bibliography of the Hebrew Book. Additionally, the only reference to this imprint is a manuscript copy (including the printers’ mark of the alleged printer) at Columbia University. Is this an imaginary copy? Could it have provenance? Or should we use another term entirely? A conundrum, indeed. One of the many that we encountered while working on Footprints. We look forward to coming across many more as we continue onward!